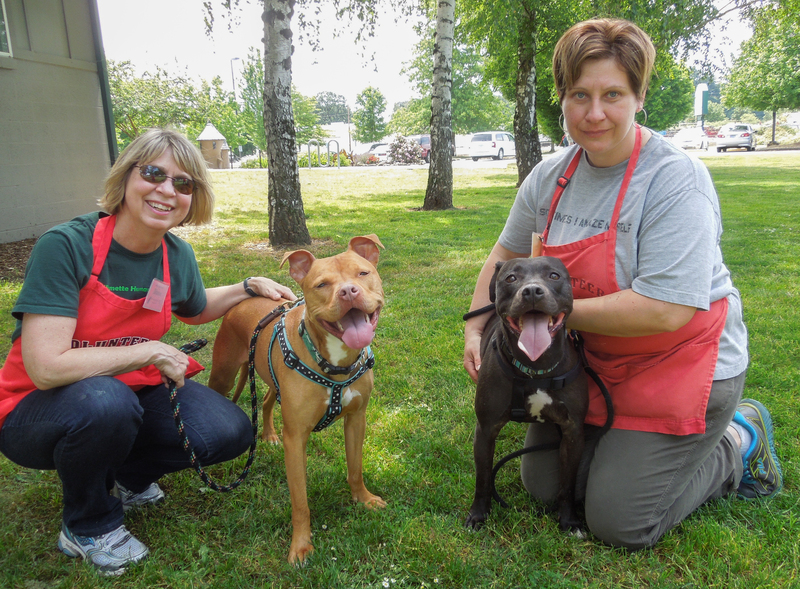 It always makes Willamette Humane Society’s staff and volunteers happy when there are many dogs adopted in a week. This week there were twenty-one! 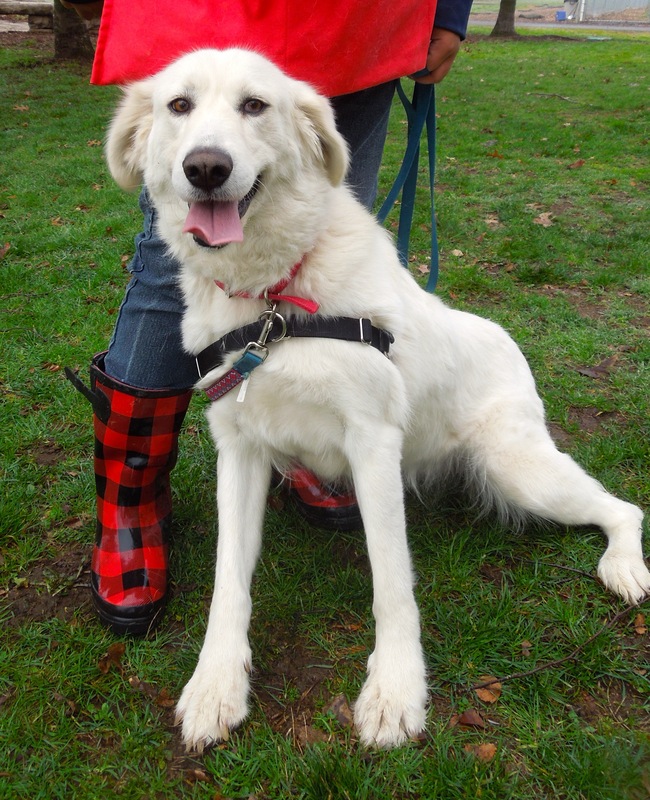 But what makes us all over the moon is when a dog who has been waiting and hoping for a new home for an extra-long time is finally found by just the right family. 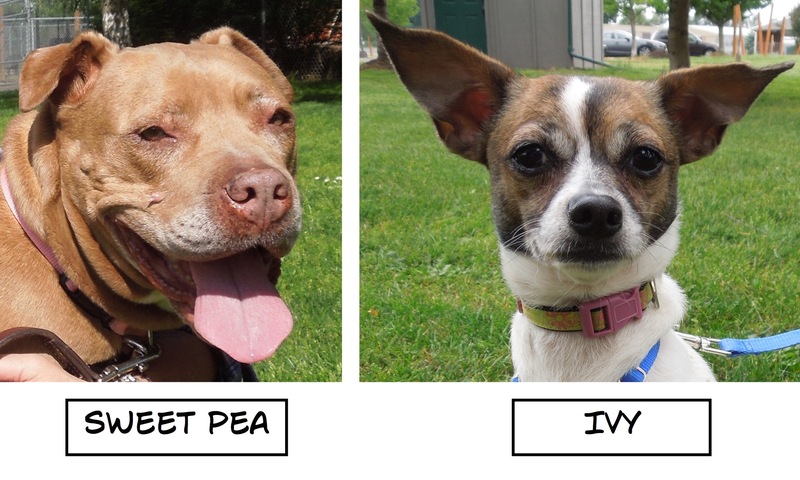 I’m thrilled to report that there were TWO of these adoptions yesterday! 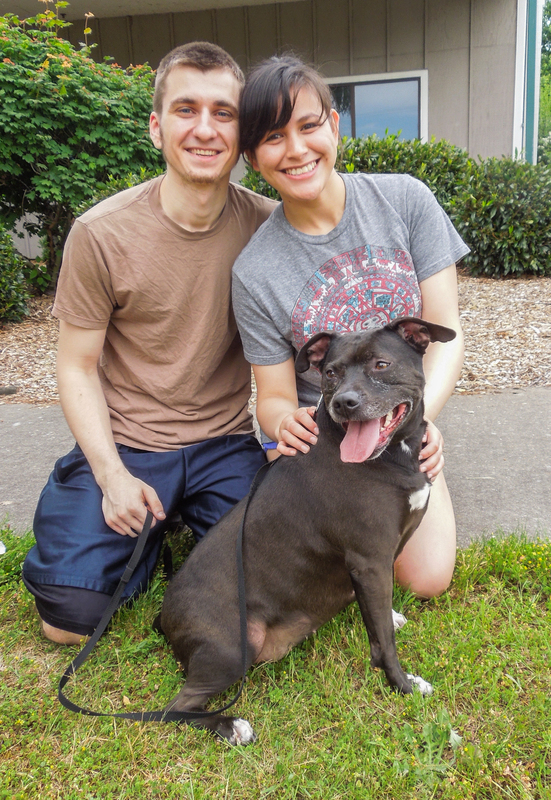 Sweet Pea is an eight-year-old Pit Bull Terrier mix who had been waiting for a new beginning since March 13th. She had lived most of her life in a California garage until the S.T.A.R.T. team brought her to WHS. 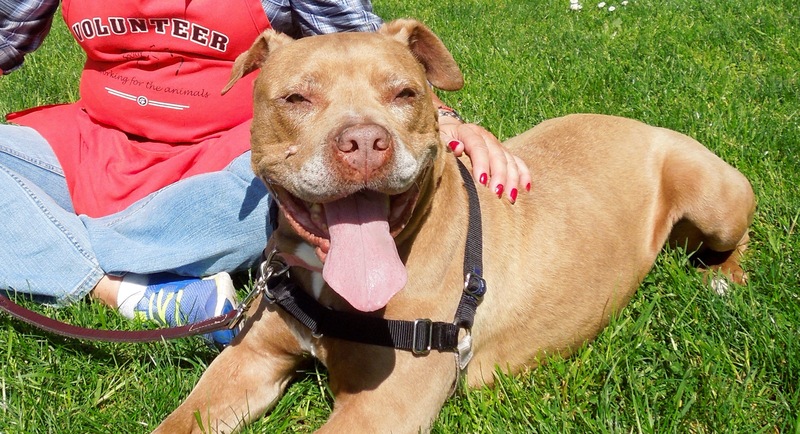 Everyone fell in love with this gentle old soul, but no one adopted her…until Monday. Here she is as she was about to head home. Can you tell she’s excited? 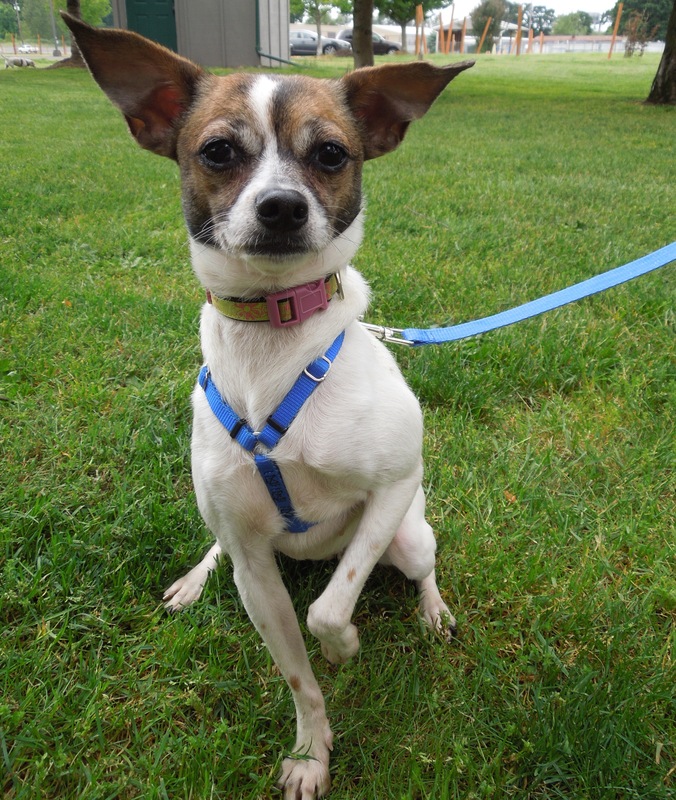 Ivy has been hoping for her new family to find her since March 29th. Yesterday her dream came true! 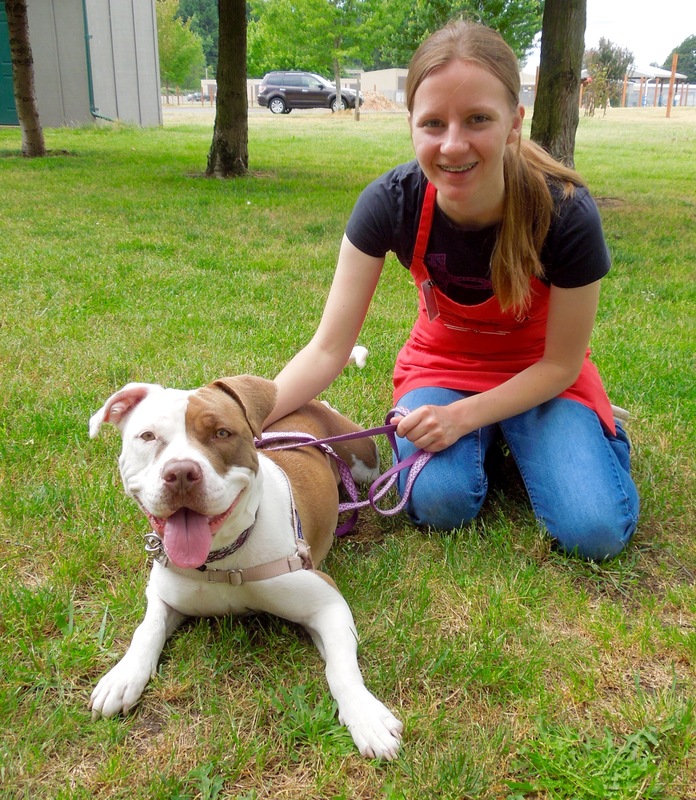 Here she was on May 30 when volunteer Joan took her to an outreach event. We are soooo happy for this sweetheart! 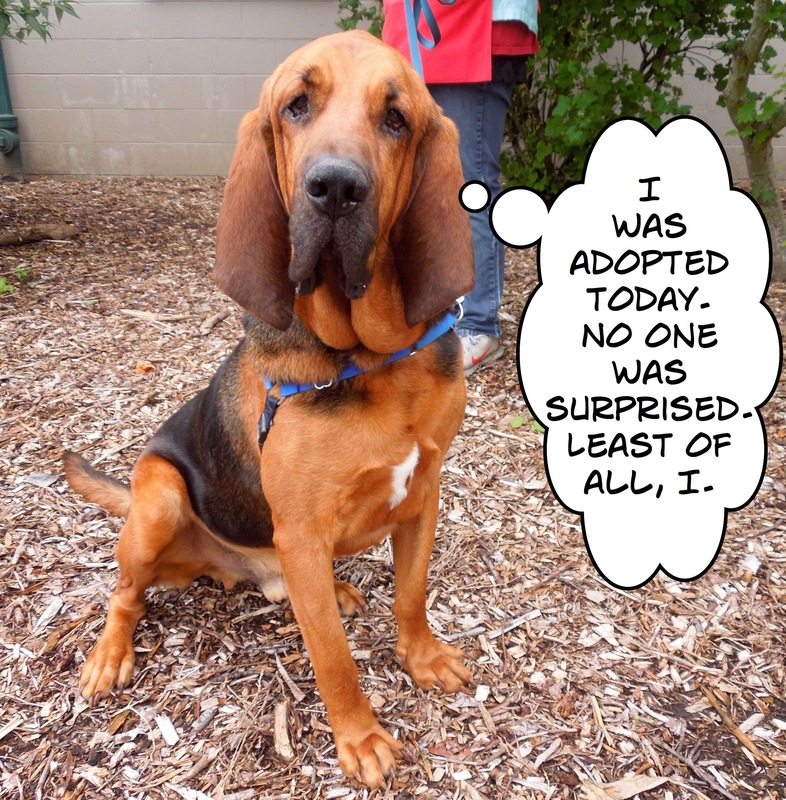 Speaking of adoptions, our purebred Bloodhound, Jackson, was also adopted. Being the extrovert that he is, he wanted me to post his own announcement. 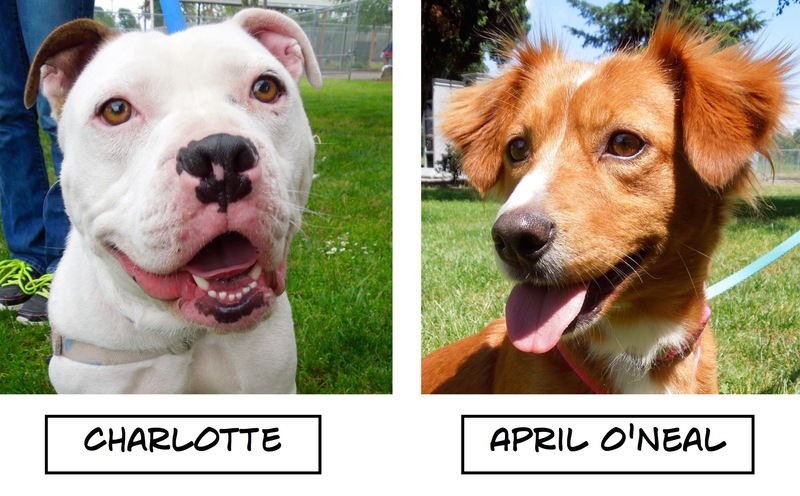 And now here are all of this week’s adopted Blog Dogs! One more note about an adoption. I had taken pictures of Kelly and planned to feature her on today’s post. However, on Sunday afternoon, a young couple met her and decided she was their perfect fit. 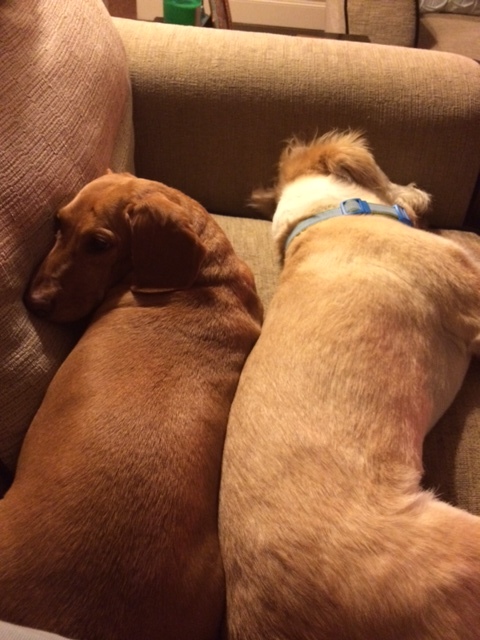 I asked them if I could put them on my blog and they happily agreed. They also promised me an update about this sweet girl in a couple of weeks. Lucky dog, lucky couple! 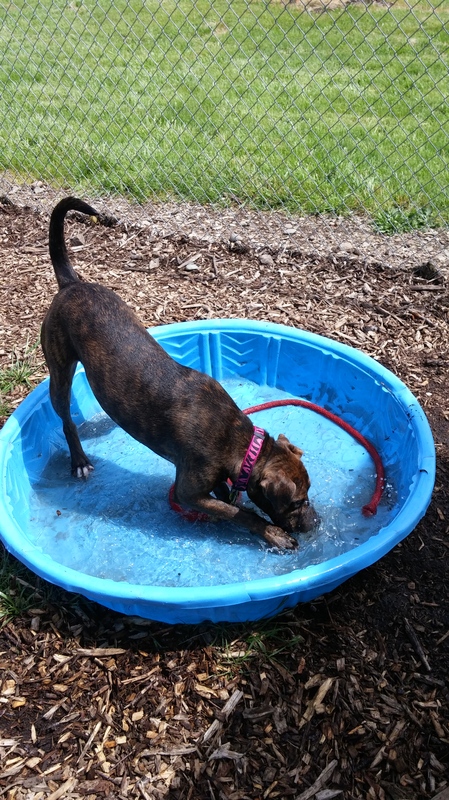 If you adopt me, we can continue my swimming lessons! 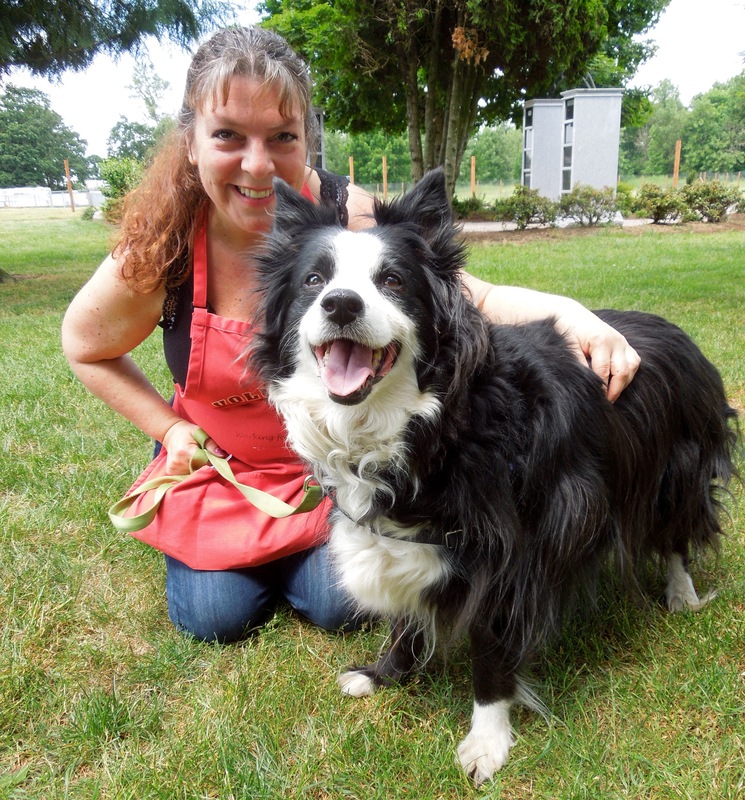 This beautiful Border Collie mix is Anne. She is nine years old. As beautiful as this girl is, she really needs to lose about ten pounds. With weight loss in mind, Anne is now enrolled in a swimming class! Volunteer Jolene takes her twice a week for a water exercise class. Anne had a trip to the groomer’s to have mats taken out of her coat, especially around the back legs, so her swim movement isn’t restricted. Jolene reports that Anne does great in the car and wrote the following about Anne’s first class. “Swim therapy was really neat. 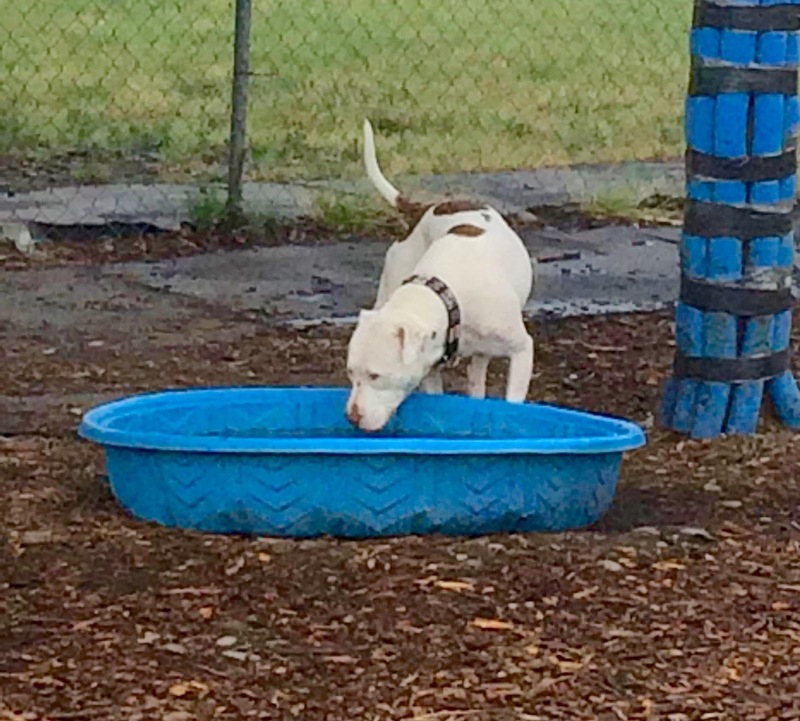 She wears a life vest and goes into the pool with a staff member at Bailey’s Journey. She swims for a few minutes, comes out of the pool for a rest. Then back in the pool for more swimming. Normally this happens 4 times in a session, but due to Anne’s age and being overweight, she hasn’t had a lot of activity so she has only done 2 rotations so far. She seems to enjoy the water. She was a little hesitant the first time in, but then she seemed to relax and enjoy being able to move freely. 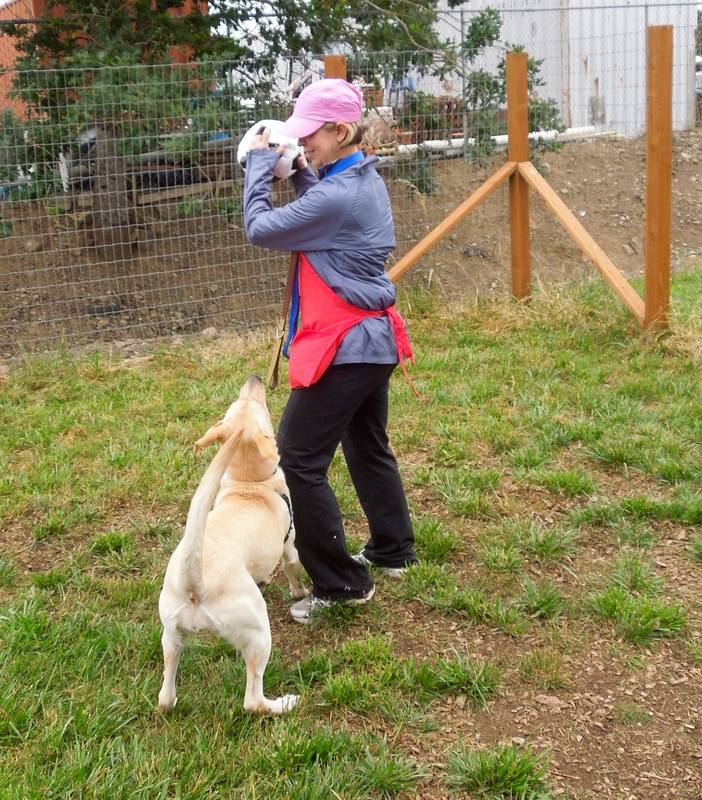 Staff told me that herding breeds like Anne really enjoy this increased activity; especially when due to her weight, she is somewhat limited in her activity out of the water. She seems tired, but happy after her swim. She is such a sweet dog and it is wonderful that there is a swim facility for dogs locally.” Here she is with volunteer Kathy. We’re new here and very shy. 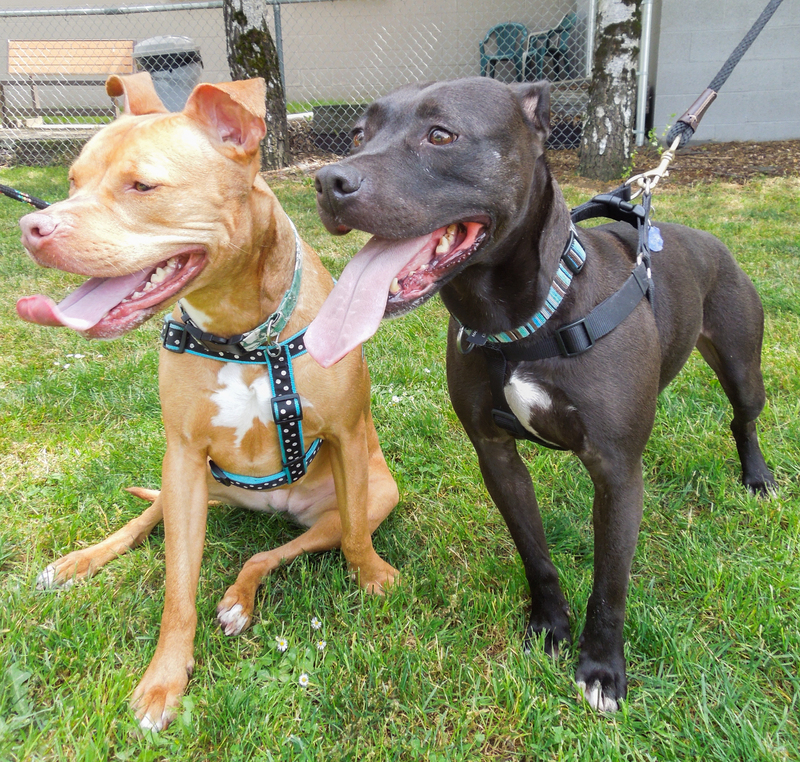 We are bonded and would like to go to a new home together. 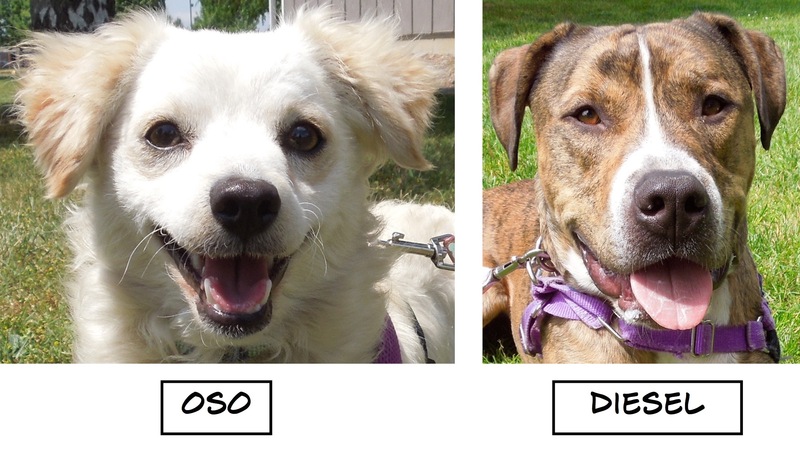 Would you like to adopt two sweet girls? Jade (left) and Mya are two newbies I met for the first time on Sunday. 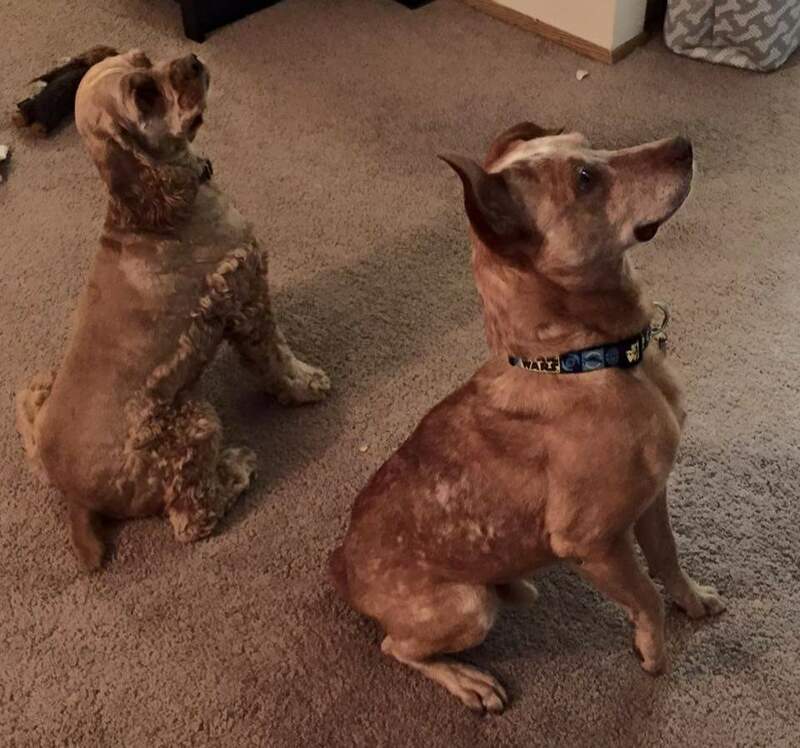 They are both five years old and are house-trained. They become anxious when separated, so are hoping to go to the same home. Their adoption is a combined package. 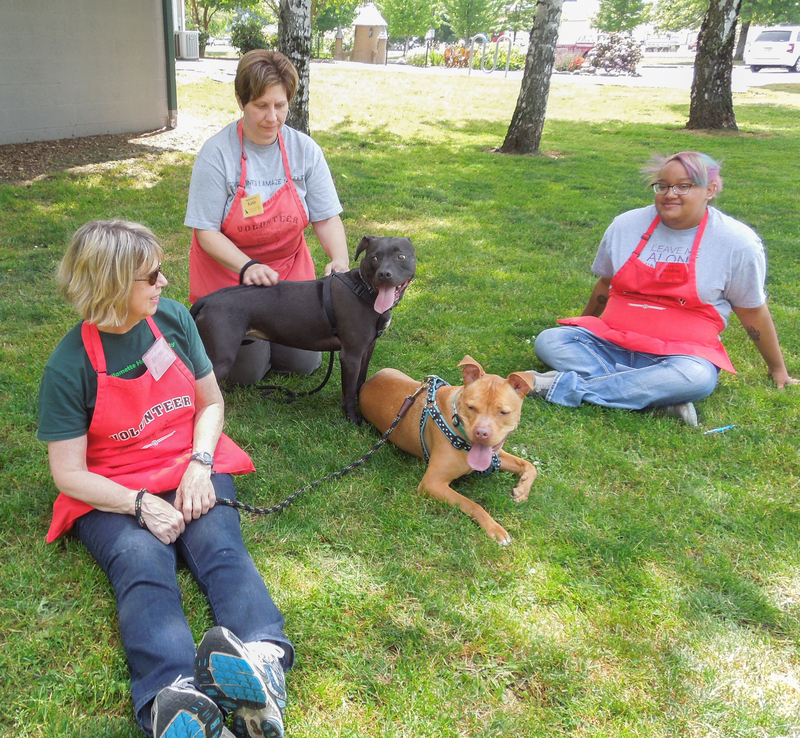 It didn’t take long for volunteers Diane, Katie, Caroline and me to fall for these girls as we sat out on the lawn trying to reassure them that WHS is a good place to wait for their next family. 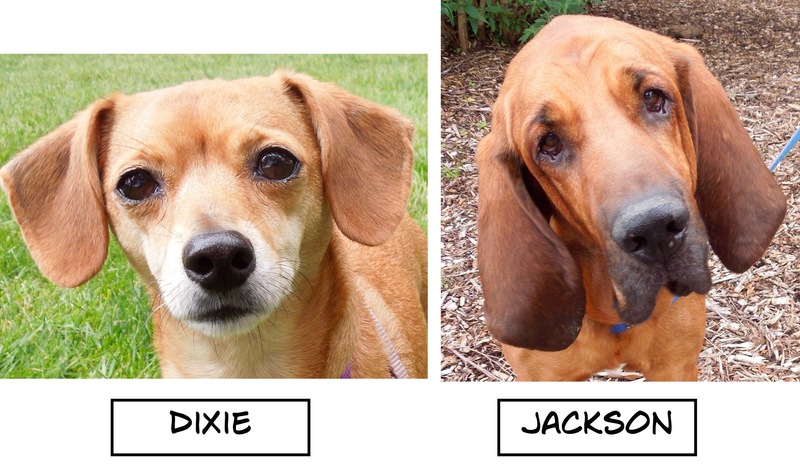 They are gentle souls hoping to meet their forever family very soon. It was fun just to hang out with the girls! 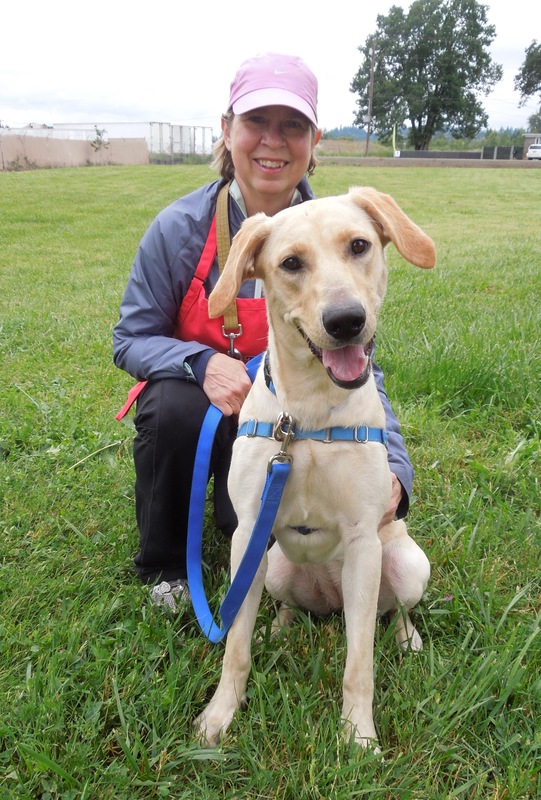 You know how you’ve always wanted a young, eager dog to go to training class with? Well you’ve found me! 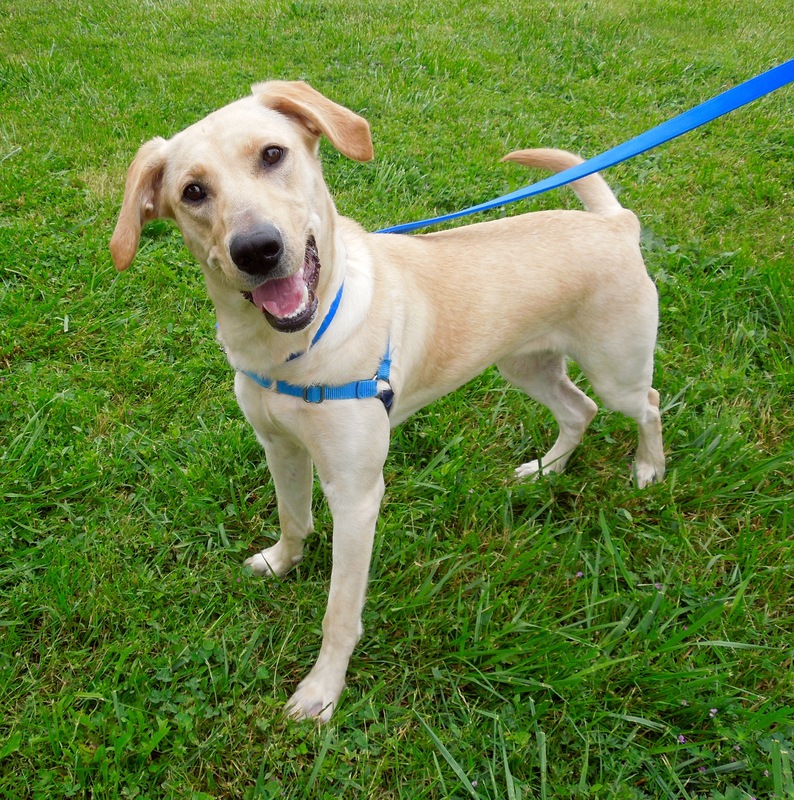 Meet Artemis, a ten-month-old youngster who is a Lab mix. She was found wandering the streets as a stray, so we don’t know about her past, but boy, do we know about her present! 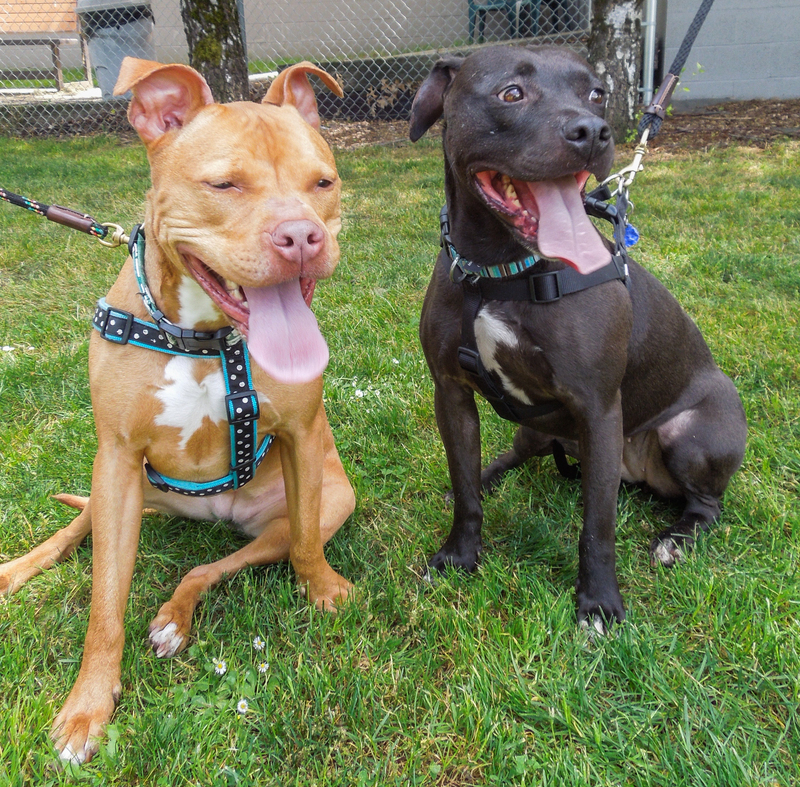 Artemis is in love with life and she can’t wait to find her forever peeps so she can start the Check In and Chill Out class that comes as part of her adoption package. She already knows a few commands like sit and down. 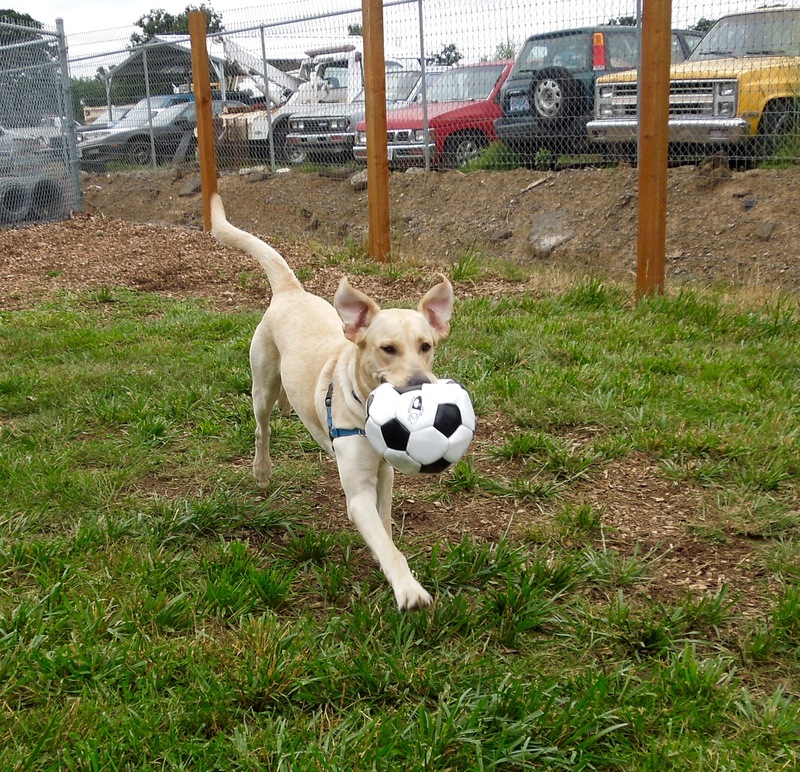 She will be a joy to train since she is highly treat- and play-motivated and is VERY eager to learn. She would probably be too energetic for young children, but older ones would be great. 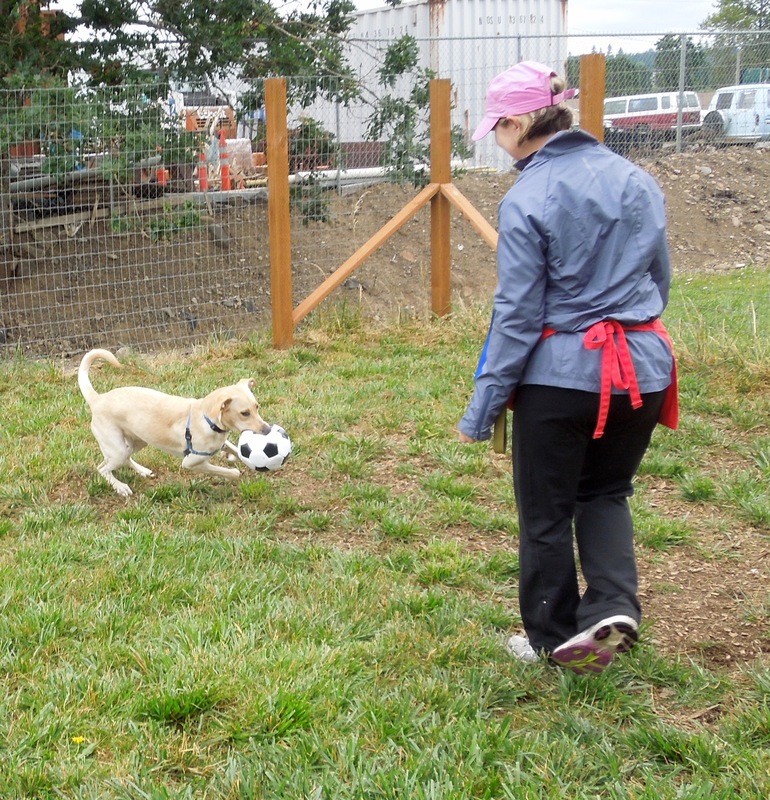 She absolutely loved my squeaky toy and soccer ball. Diane and I spent some time playing with this bundle of life. Can you tell this is a very happy girl? Look deeply into my eyes! You know you want to adopt me! 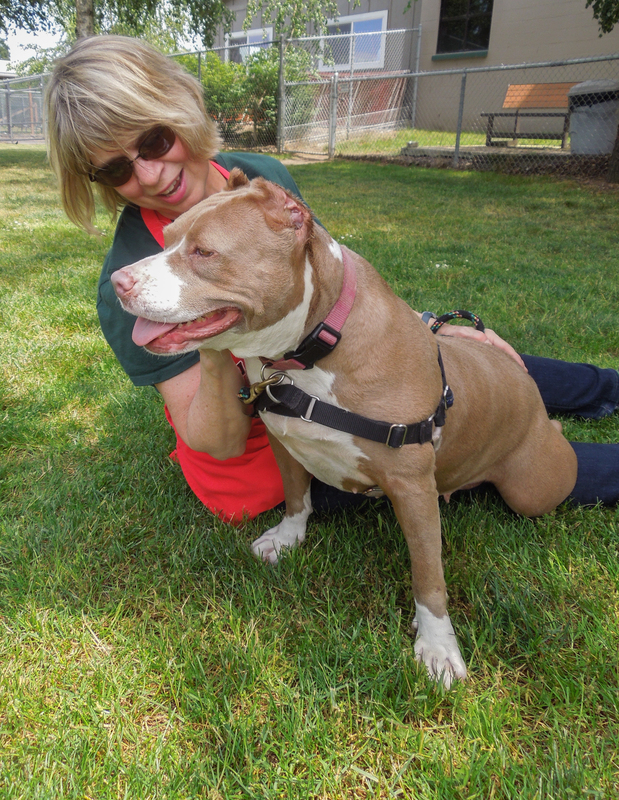 This is Kelly, a four-year-old American Staffordshire mix. 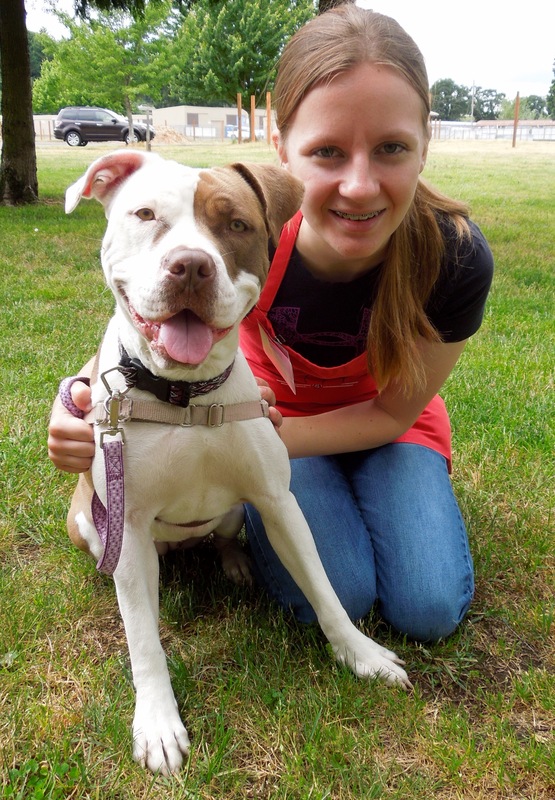 She came to WHS as part of our partnership with ASPCA, transported from an overcrowded shelter in California. Despite the fact that someone cut off her ears, she loves everyone and has the most wonderful smile. Kelly would like to lose a few pounds (15-20) and going for long walks would be a big help on her quest! Kelly is affectionate and loves hanging out with her fans. She would prefer to be the only dog in the family, but would like to have human sisters and brothers. She will make a terrific family dog. Here she is with Diane. They tell me I’m a gentle giant. I think they’re right! The first time I met Trucker was Sunday. He was lying flat on his stomach in the hallway at the shelter. The floor had been mopped and Trucker had decided it was too slippery to walk on. One can’t be too careful when you are eight years old and 125 pounds! After some coaxing, Trucker walked outside and enjoyed spending some quiet time with Daniel. 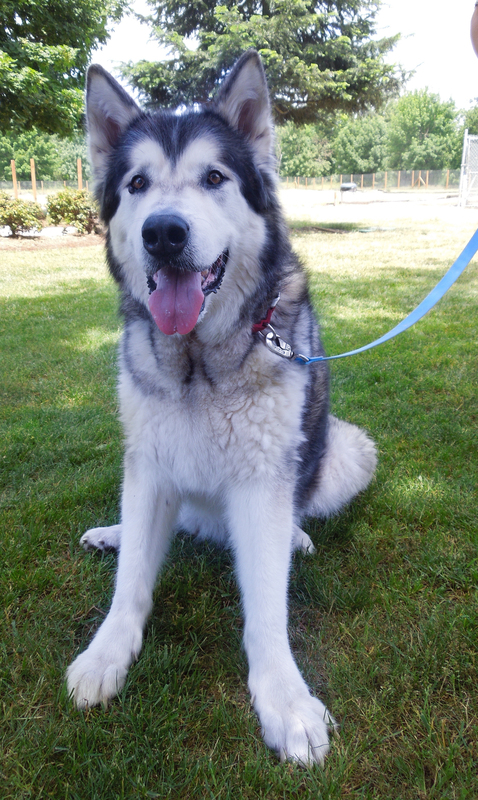 Trucker is an Alaskan Malamute mix who scored so well on his behavior assessment that he is rated PG+5. He is house-trained and has an excellent history with children. This boy needs a loving retirement home where he can go for leisurely short walks and then curl up with the family for the evening and snooze. Oh, and one more thing, Trucker loves to visit with you, as volunteer Kate discovered and sent this video to me. Do you need someone to sit on your lap? I’d be happy to! 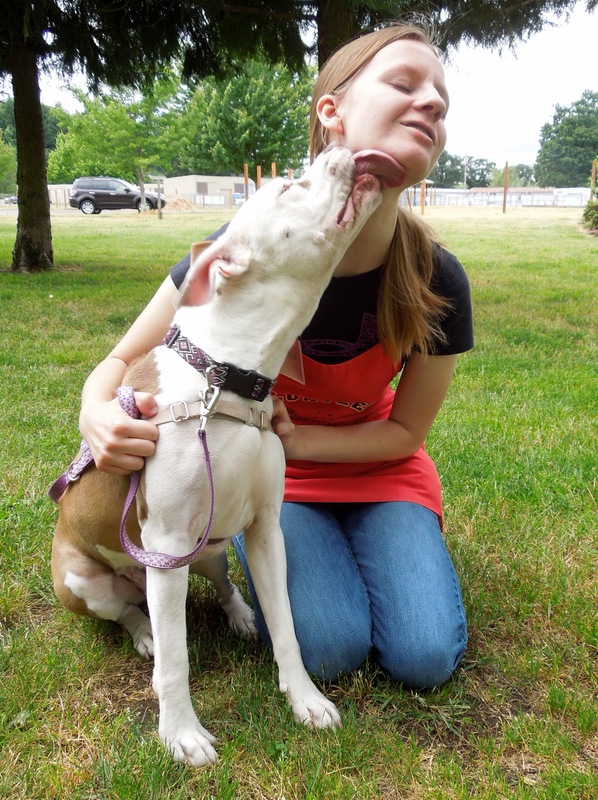 Volunteer Marianne has yet another favorite at the shelter! The Bulldog mix sitting on Marianne’s lap is Hancock. 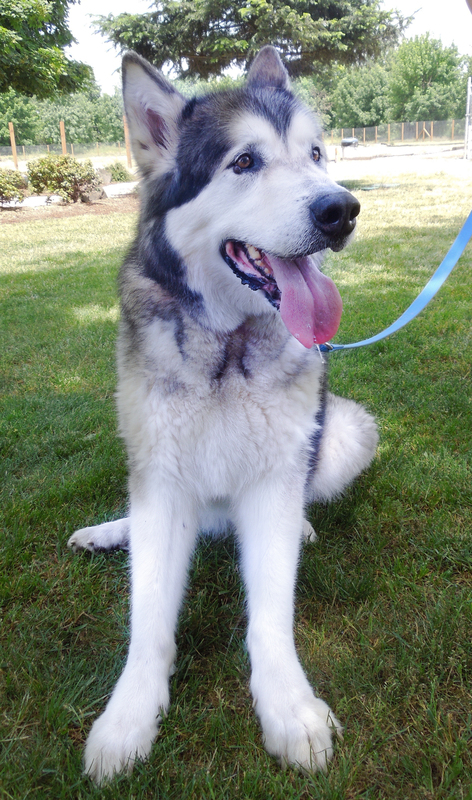 He’s six years old and came to us from a rescue to see if he could find a loving home through WHS. 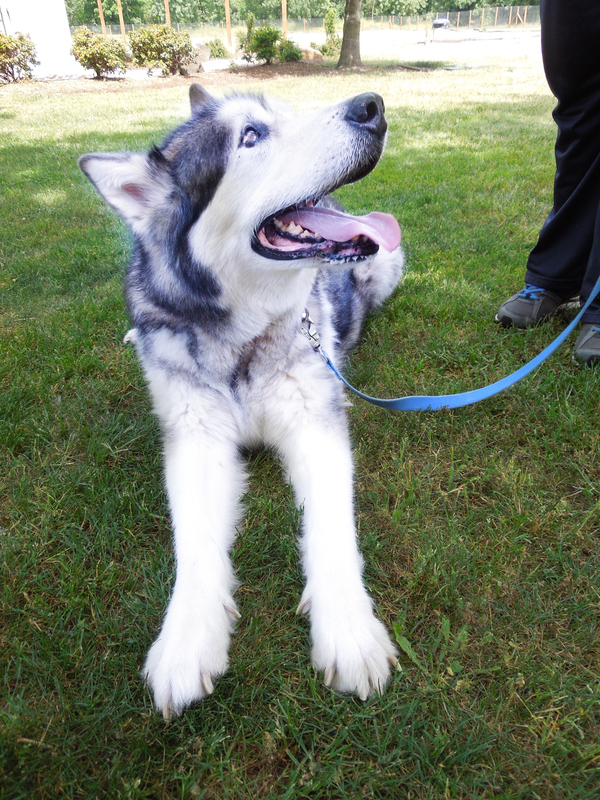 Hancock is a sweet, uncomplicated older boy with some moderate signs of aging. He’s hoping maybe a retired person might want a retired Bulldog for companionship. Need someone to walk around the block with? 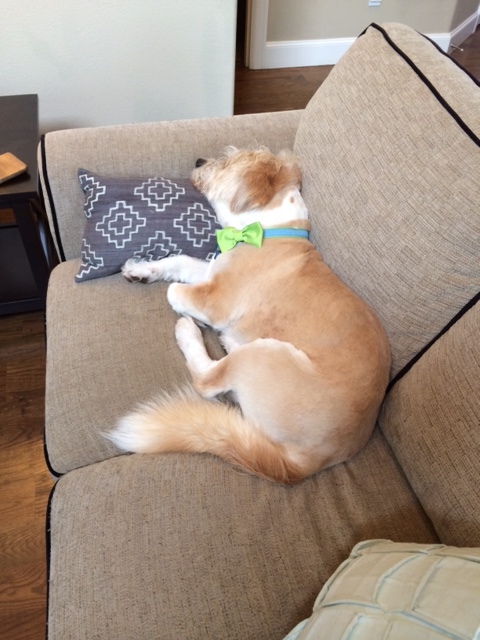 Someone to curl up next to you while you watch TV or read? Someone who will be happy just to be close to you? Need a best friend? Hancock may just be your perfect companion. 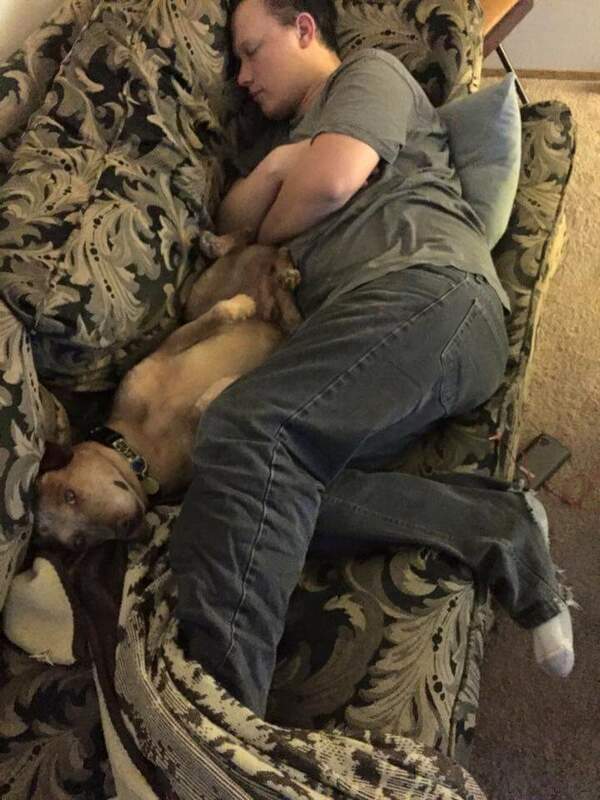 We’re hoping Hancock will be snoozing next to his forever person very soon. I’m going to become your best friend! 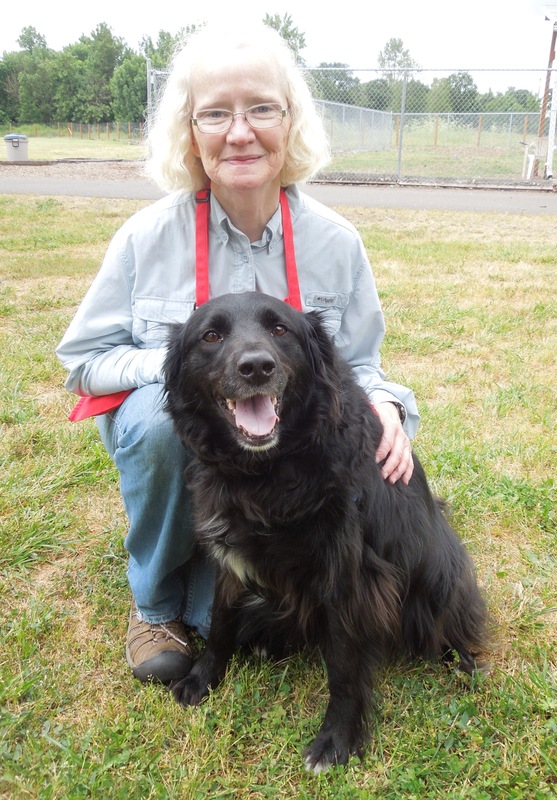 Sarah is a four-year-old Retriever/Border Collie mix. 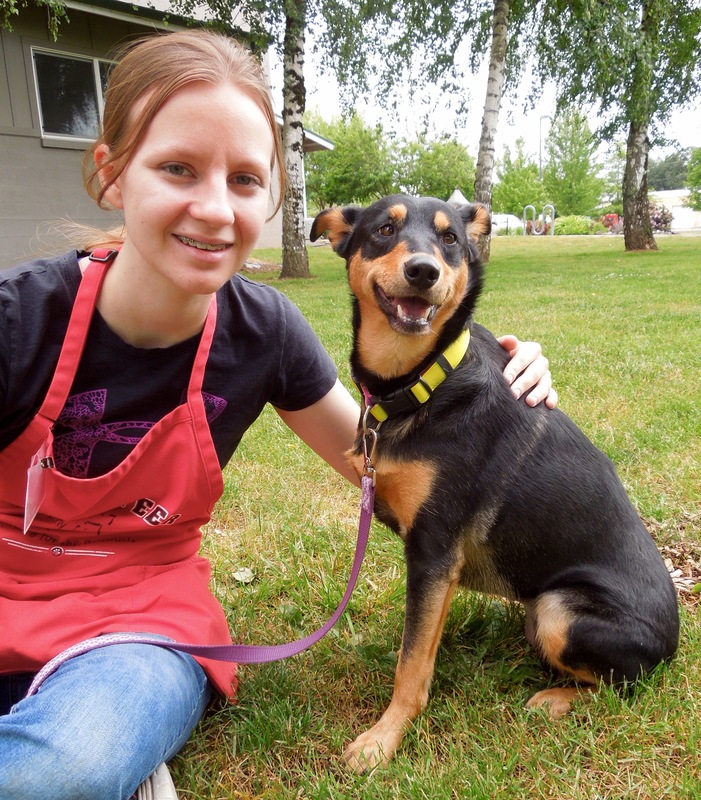 She has a lot of energy, but is also affectionate and eager. She will be a great family dog for older kids. 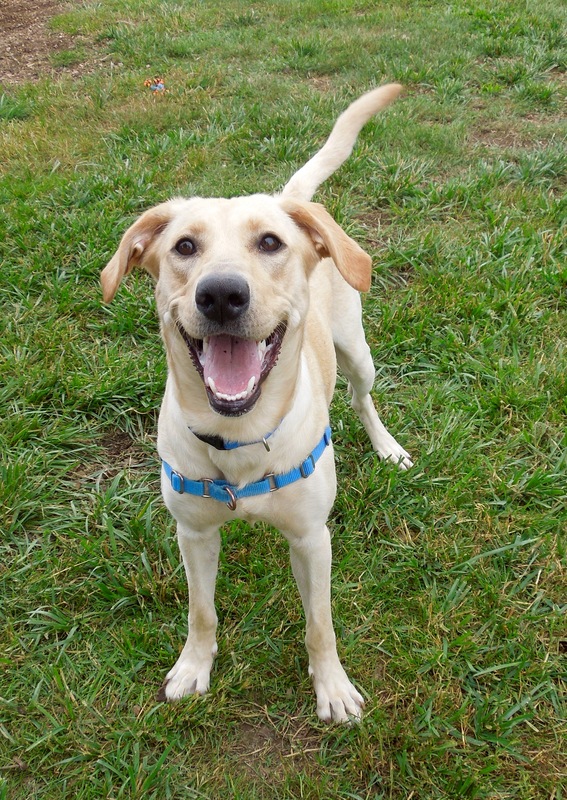 Long walks and vigorous play sessions will help her lose some excess pounds! 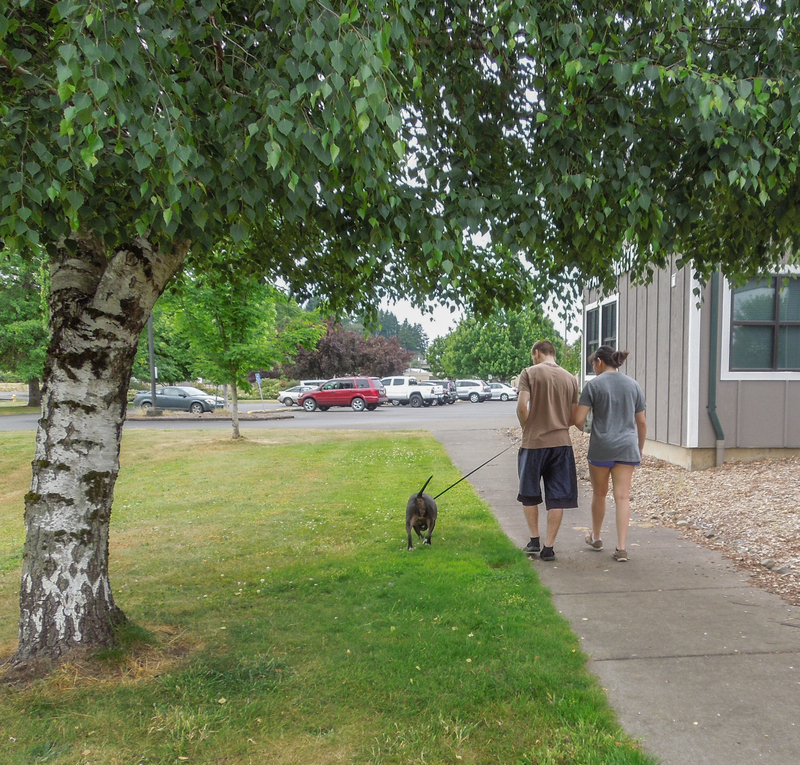 This is Sarah’s second time at the shelter and hopefully her last. 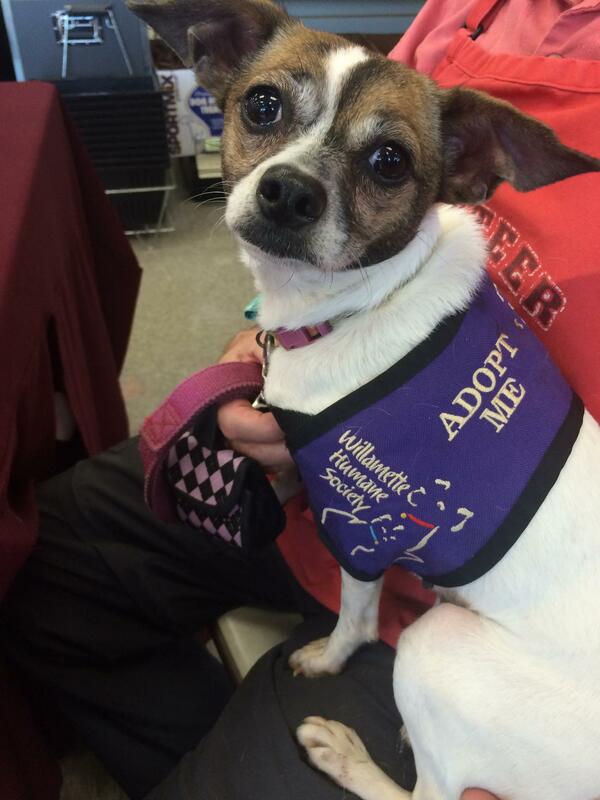 She’s betting the next family who adopts her will be her forever one. Here she was on Sunday with Tiffany and Seryna. Here is Sarah today with Sandra. Remember me? 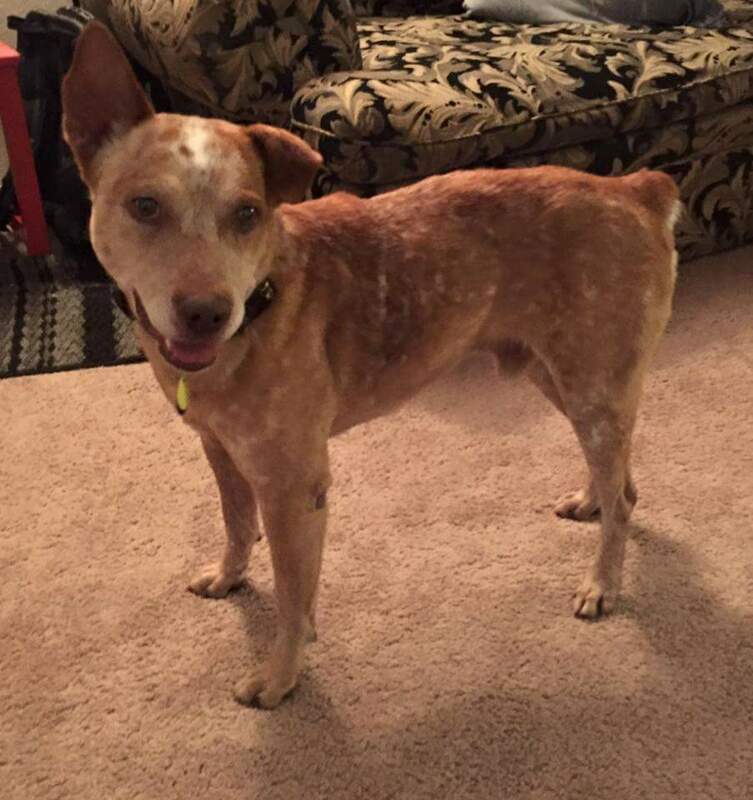 I’m back and I can’t wait for my forever family to find me! 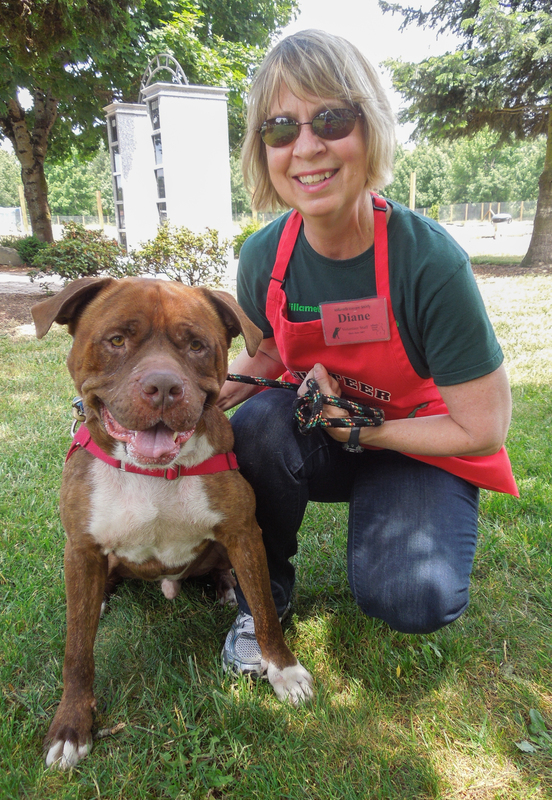 One of the volunteers’ favorite boys is Dolce! 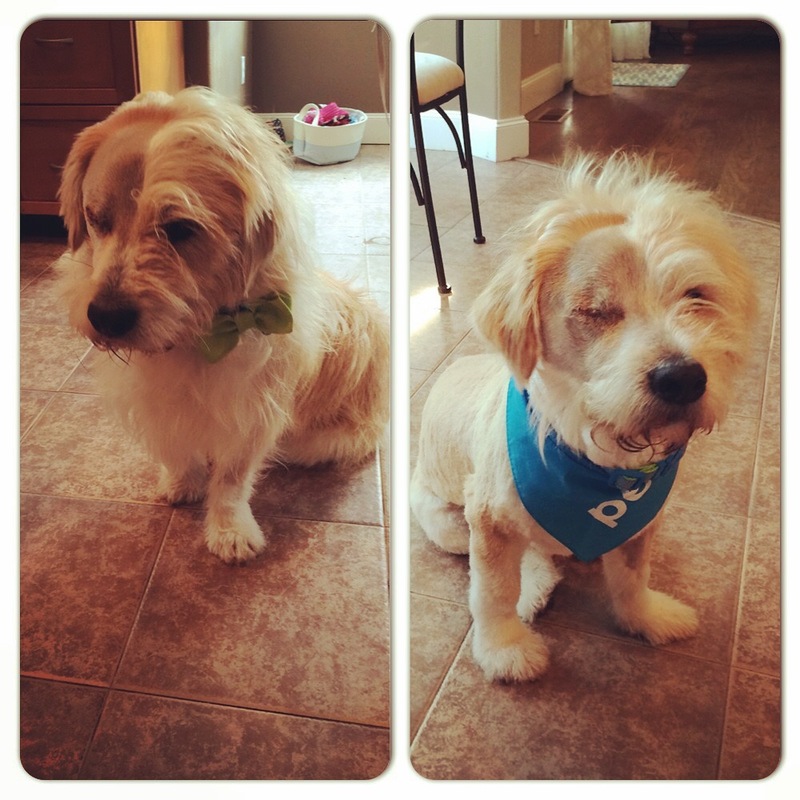 He was adopted, but returned when it didn’t work out. 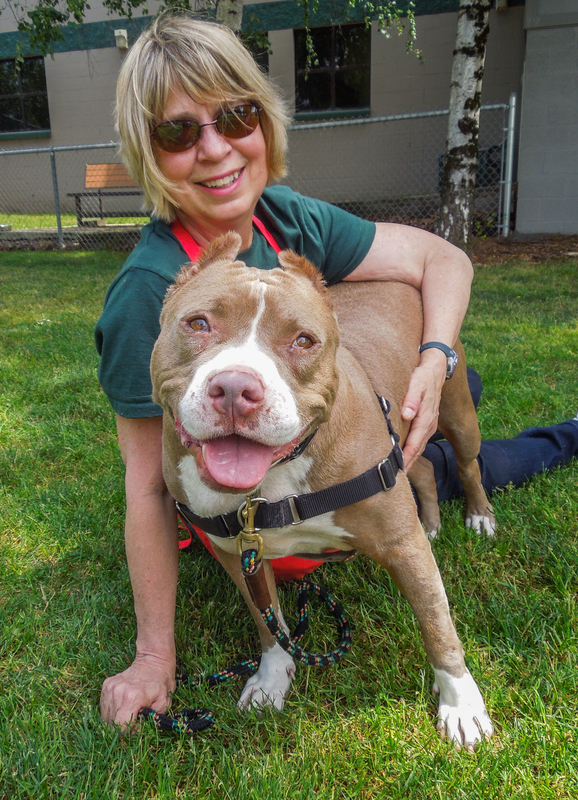 This giant lap dog is a sixty-pound, seven-year-old Pit Bull Terrier marshmallow. 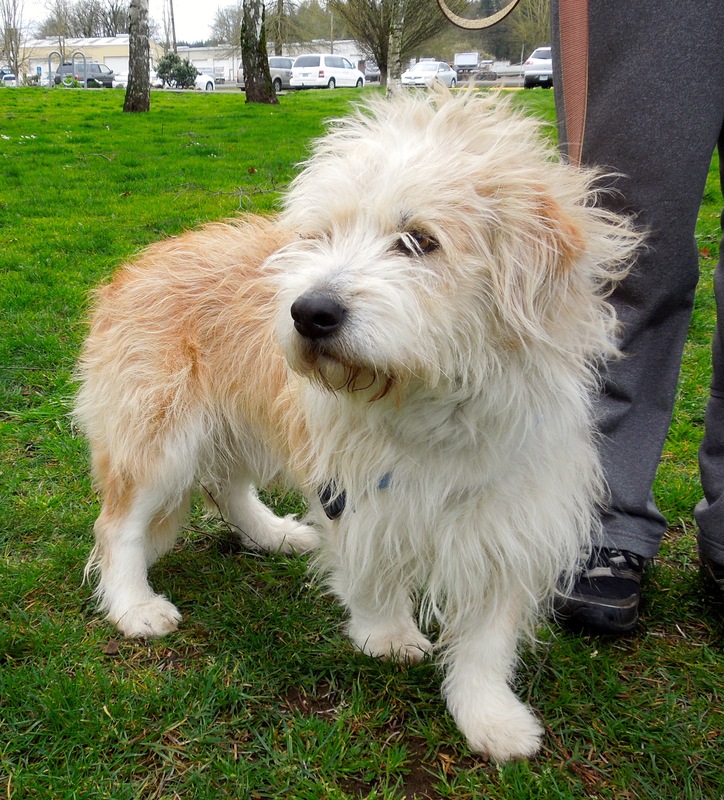 He is house-trained, crate-trained and loves people, other dogs, and even cats (usually). He has lots of energy which he’d like to spend doing activities with his people. 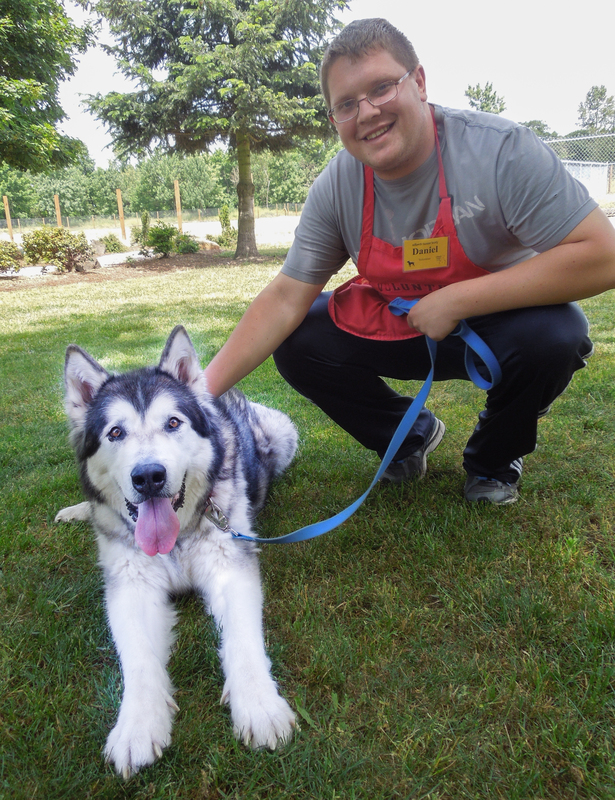 Since he is very food-motivated, he’s great fun to teach, and would thoroughly enjoy our WHS training classes. 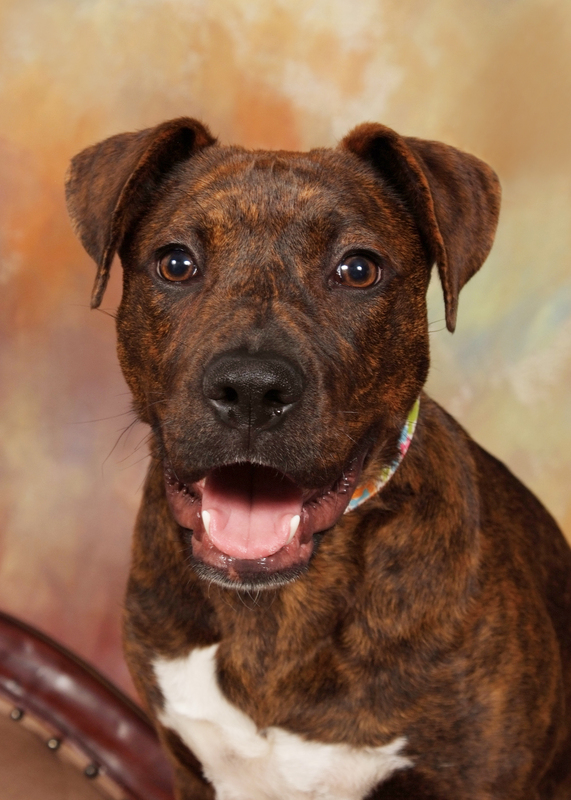 Dolce has a great sense of humor and is simply a delightful boy. 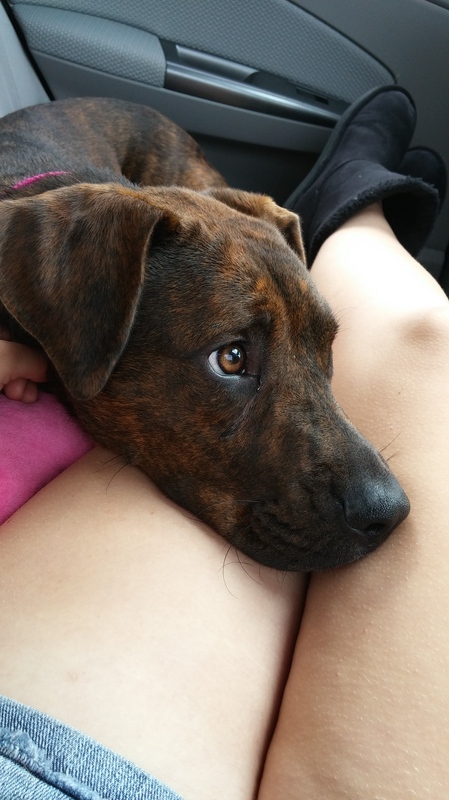 Some family will be very lucky to get this sweet lap dog! Diane is one of his many WHS fans. It’s me again. Still here. Still waiting for you. 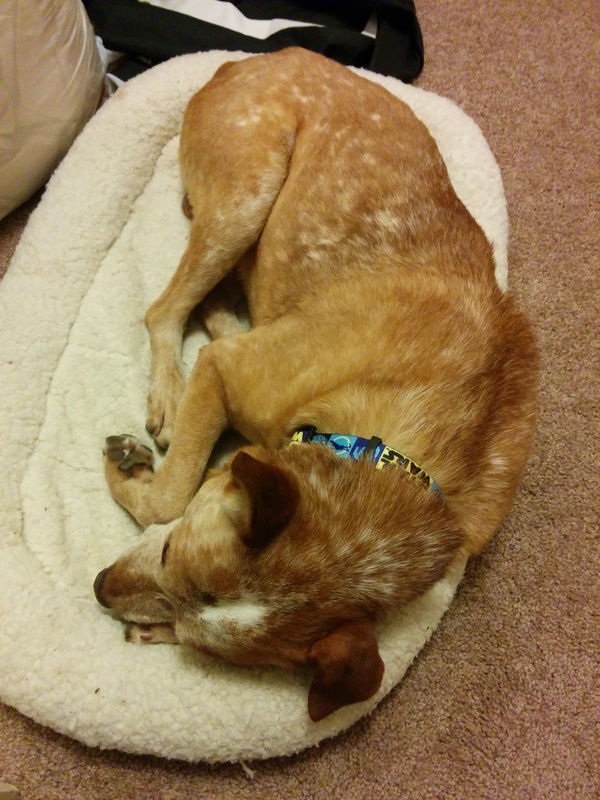 I got the following pictures from volunteer Jordyn, one of Rosco‘s favorite peeps. He had a great shelter day on Monday! 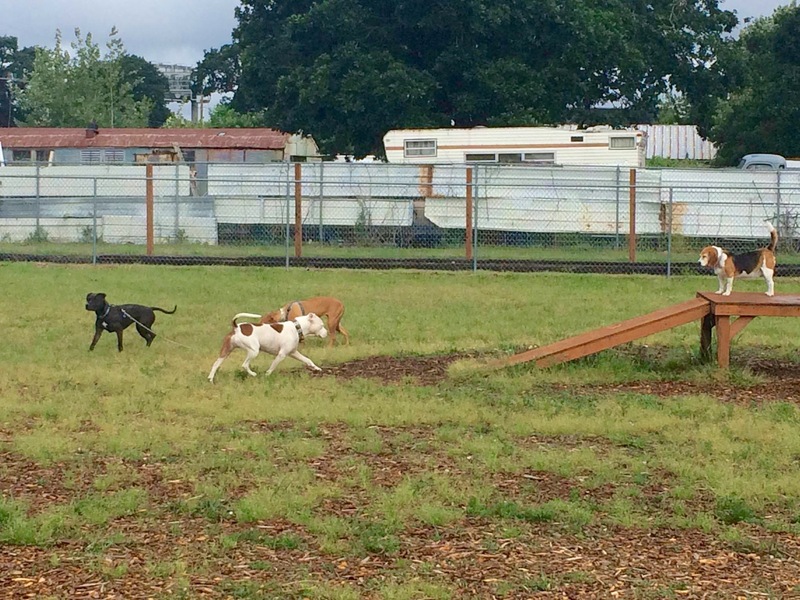 He got to go to playgroup and romp with his friends. Jordyn wrote: “He was kissing Jade, and running with Hunter. He was smiling from ear to ear. It brought me to tears, but happy tears. It’s so nice to see how much he has improved. He was just a happy dog. 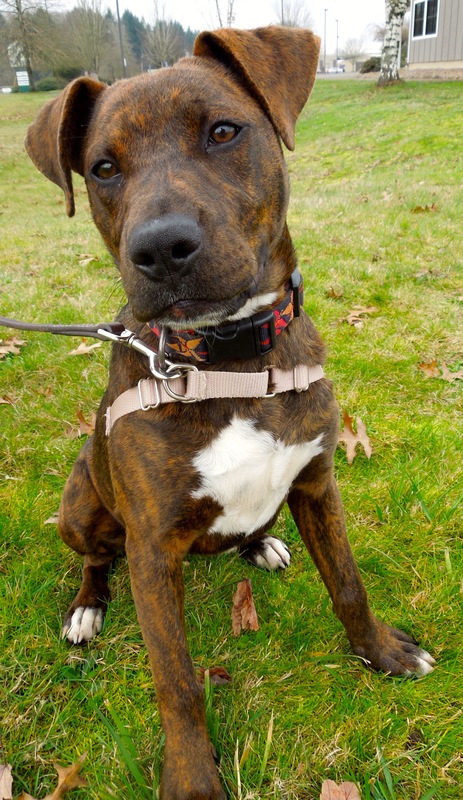 It warmed my heart.” Rosco is a two-year-old Pit Bull Terrier mix who is very loved by everyone at WHS. 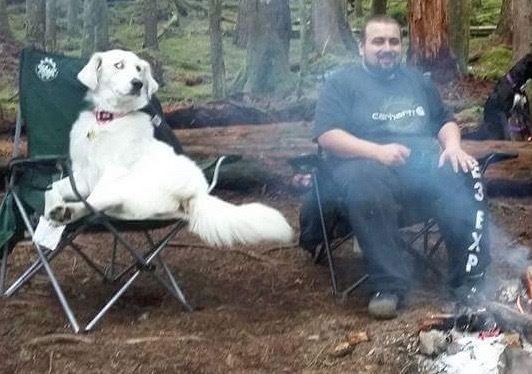 He can be a bit picky about his dog friends, so he will need to meet anyone he would be living with. 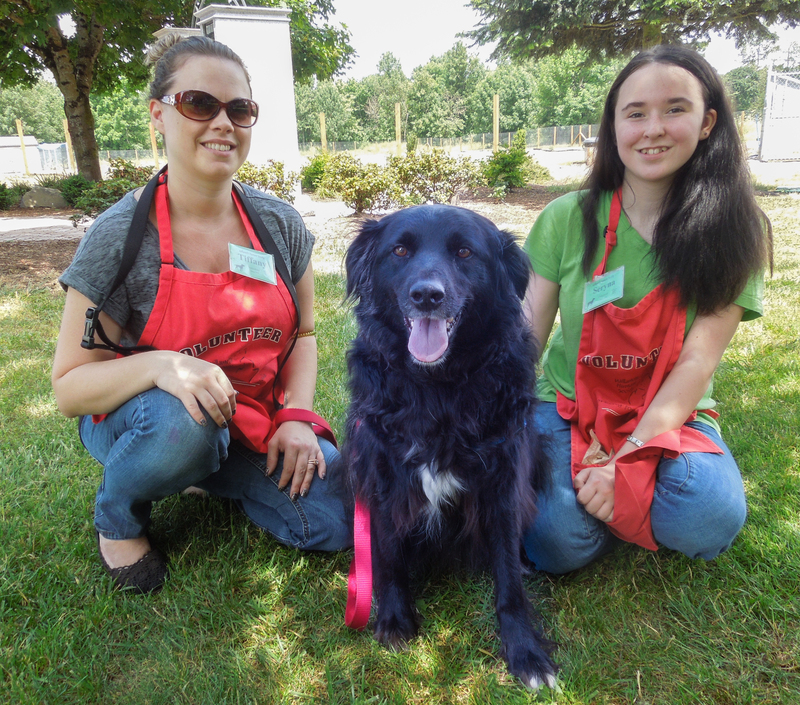 But he’s such a great dog who has gone on many outings with volunteers who can’t stop singing his praises. 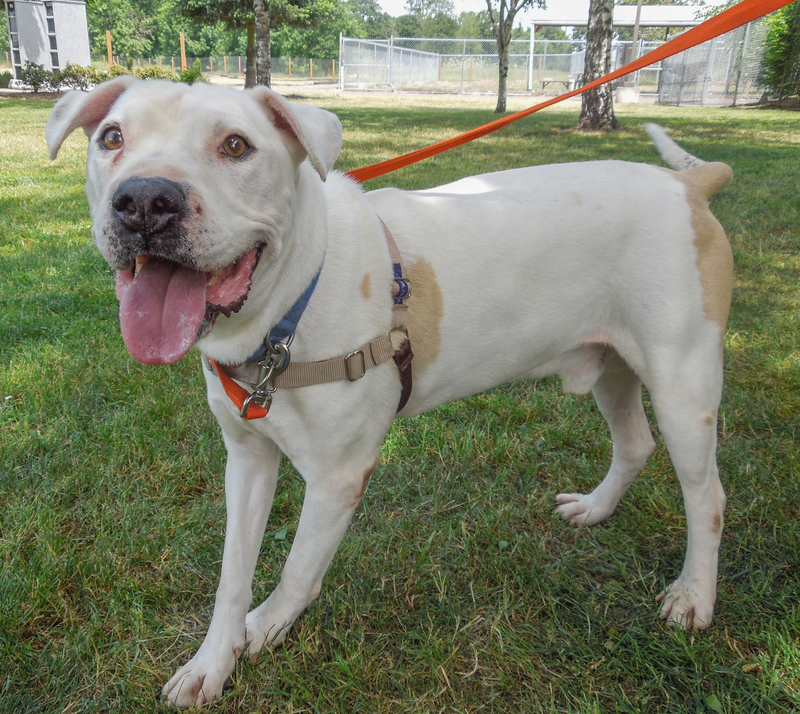 We just don’t understand why Rosco hasn’t been found by his perfect family yet. 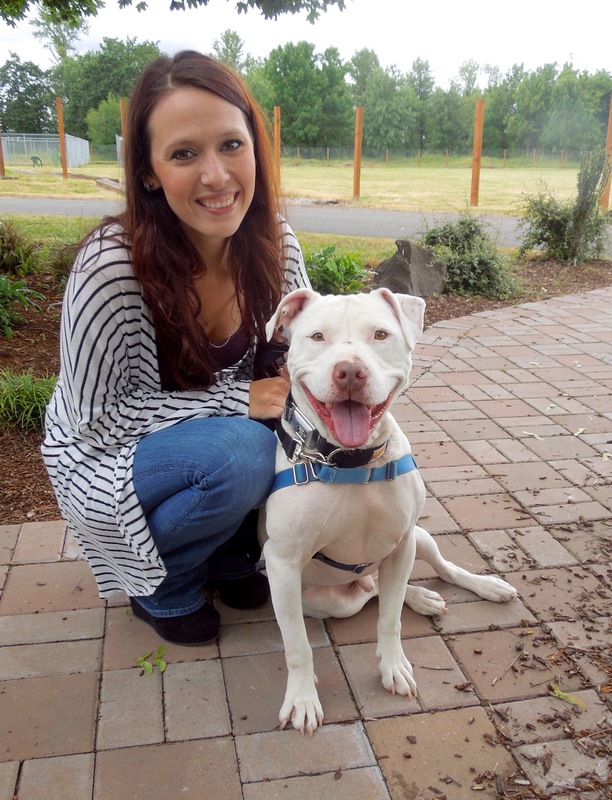 Volunteer Ashley loves Rosco so much she visits him every day on her lunch hour. Here they were today. Today Emelynn had a dilemma. She had planned to have long-termer Rosie to be her Pick of the Week. 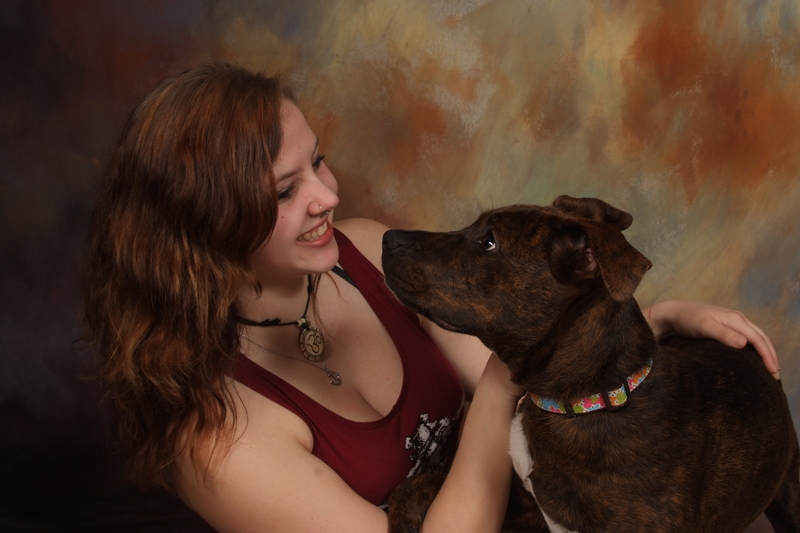 So we took pictures. 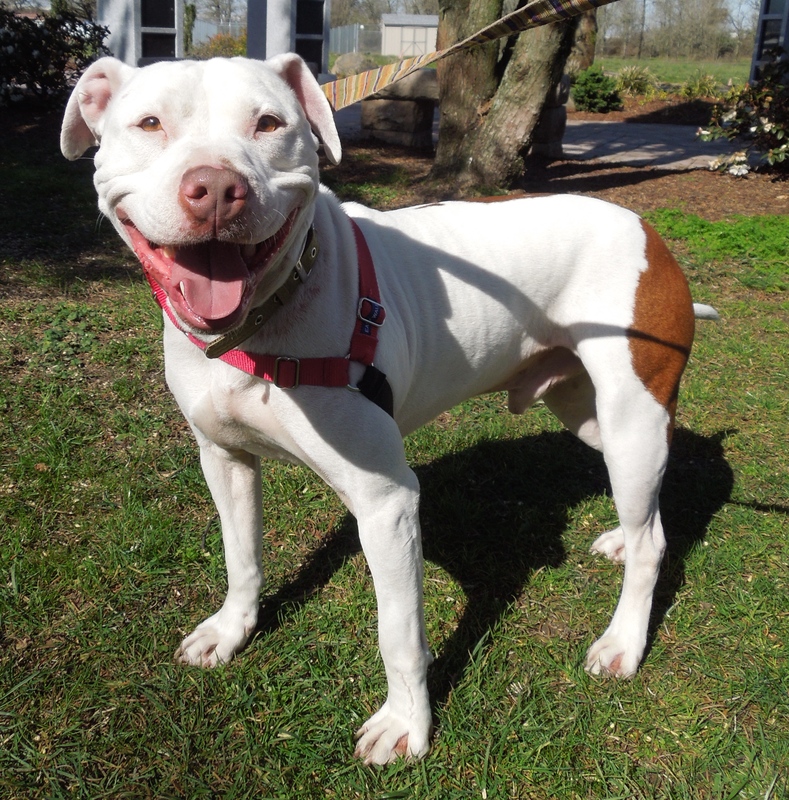 Rosie is a two-year-old American Bulldog mix. She loves people, but her exuberance would be too much for young children. She also would like to be an only pet. 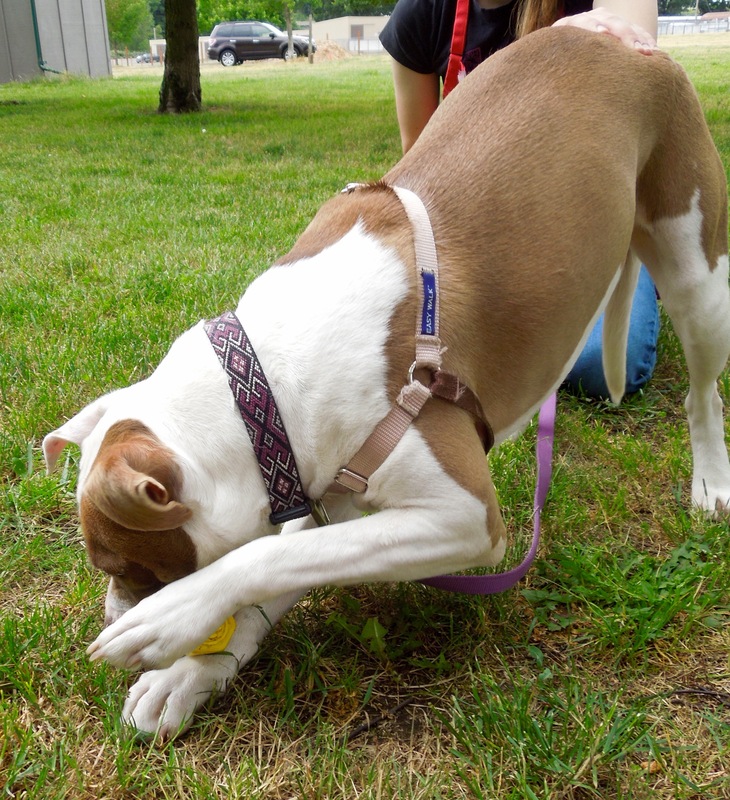 While she likes to romp with other dogs, she is a rough-and-tumble player with them and doesn’t know when to stop poking and chasing, which other dogs find annoying. But with people, she is a cuddler. She takes treats politely and knows several commands like sit and down. She has been waiting for the right fit of a family since April 10th. 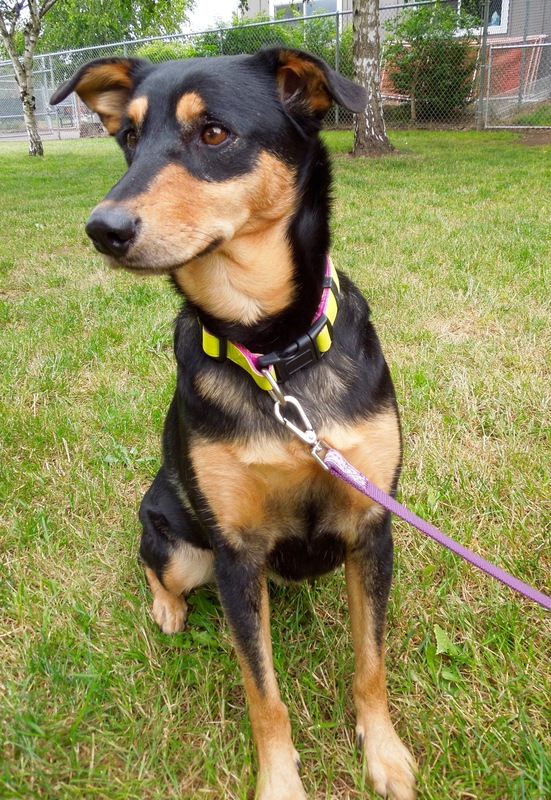 For someone looking for a fun, loving and playful only pet, Rosie might just be perfect! 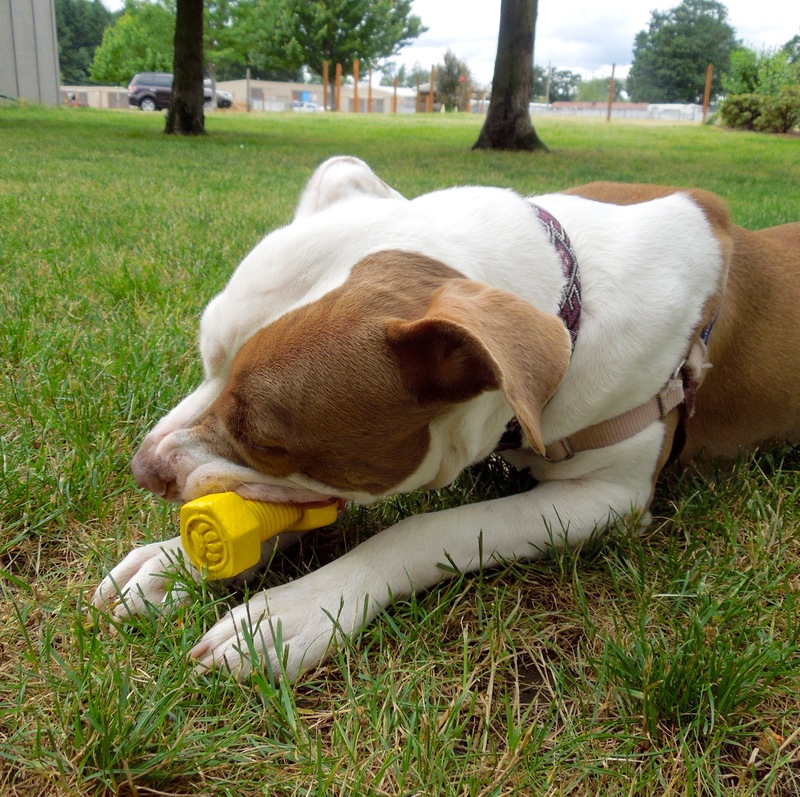 I gave Rosie my squeaky toy to play with and what a hit it made with her! She absolutely was over the moon making it squeak! 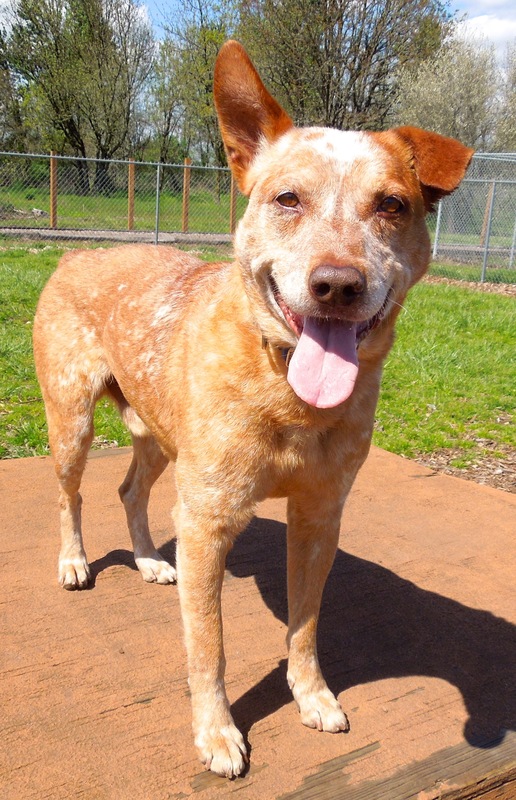 Shyla, a two-year-old Australian Cattle Dog mix, is a new arrival at WHS and is extremely shy and nervous. It took Emelynn lots of time and patience to coax her out of her kennel to go outside for pictures. But once in the yard, both Emelynn and I fell in love with this sweet, quiet girl. She was hesitant at first to take the hot dog bit I offered, but slowly began to warm up and gently licked treats from my hand. 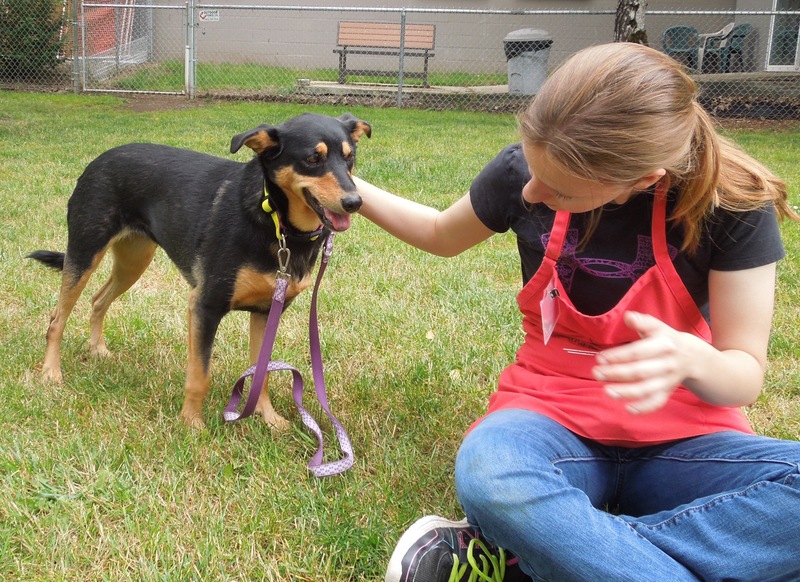 Shyla will need a calm, understanding, and patient family to build up her confidence, but it was very easy to see that she will be well worth the effort. It was also very easy to see why Emelynn needed two Picks of the Week! WHS staff member Samantha sent me four wonderful updates that came into the shelter last week and said that I could share them with you. Thank you, Sam! 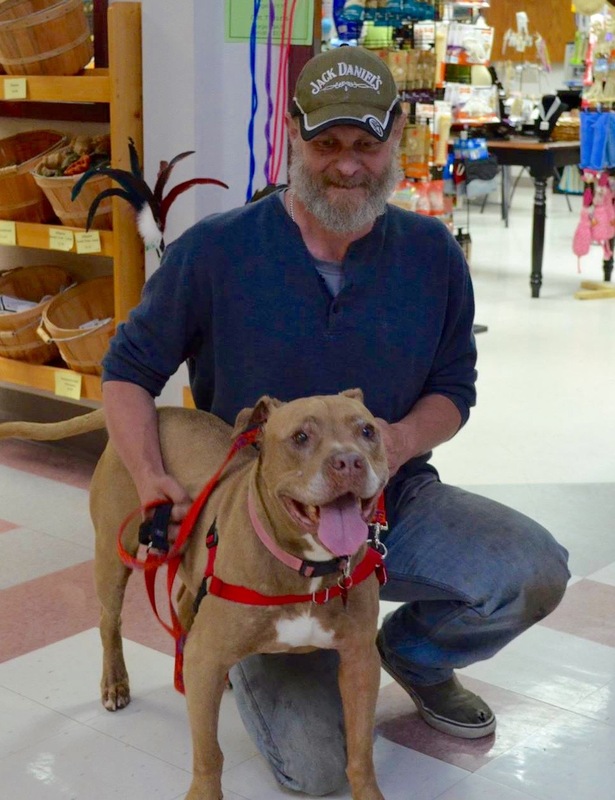 Remember Belle, the beautiful girl who was so frightened of change that she stayed in the adopter’s garage for days before venturing into the house? 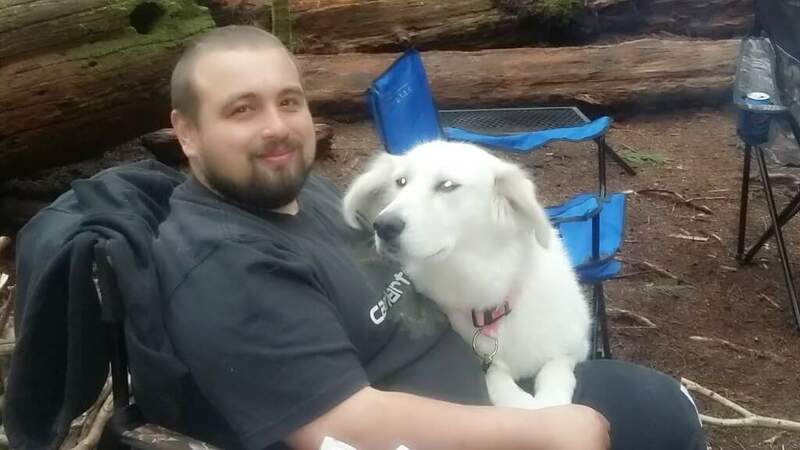 Well the family sent shots from the their first camping trip with Belle. I think it’s safe to say she has adjusted well! Here she was at WHS. 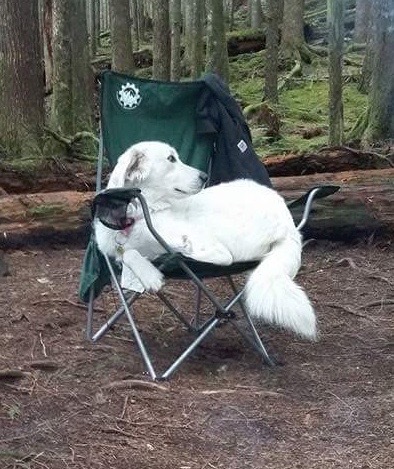 And here she is camping! 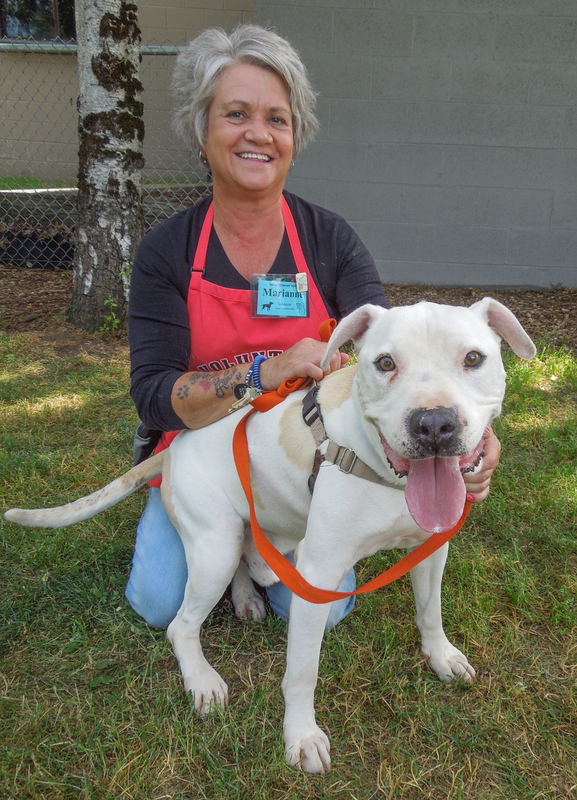 Remember Spencer, the extremely nervous boy at the shelter? This little guy needed some grooming when he arrived at WHS. This was puppy Leila Jean when she arrived at the shelter via S.T.A.R.T. 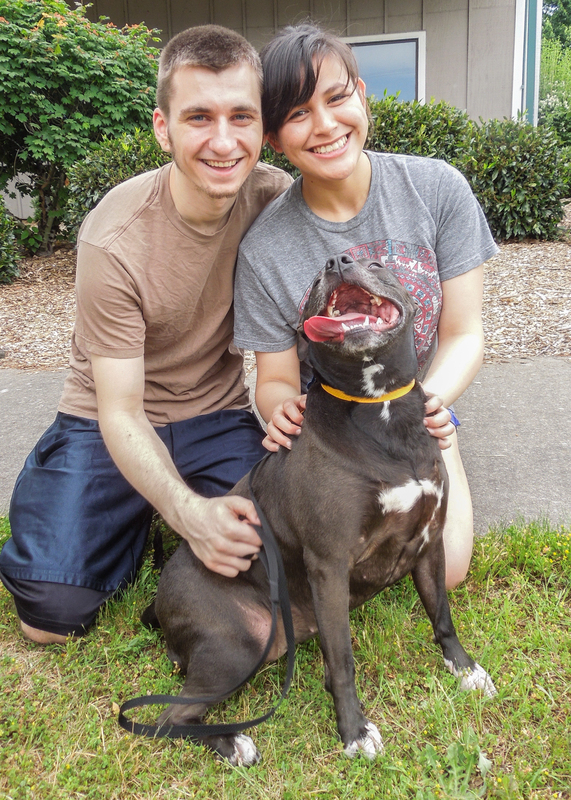 WHS staff member Kaylee adopted her and this is what she looks like now! We get to see her often, as she comes to work with Kaylee. And with those happy updates, that’s it for this week! I miss you guys SO MUCH!!! Love to see all the smiling doggie faces! Glad there were so many adoptions this week!